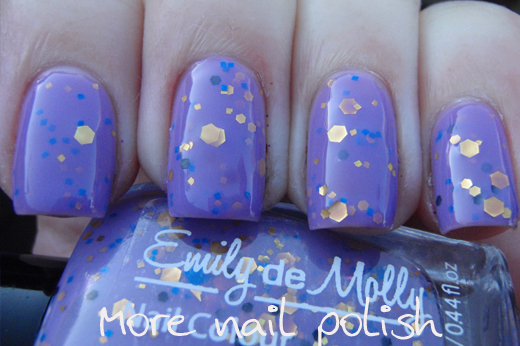 I have two more Emily de Molly polishes to share today. 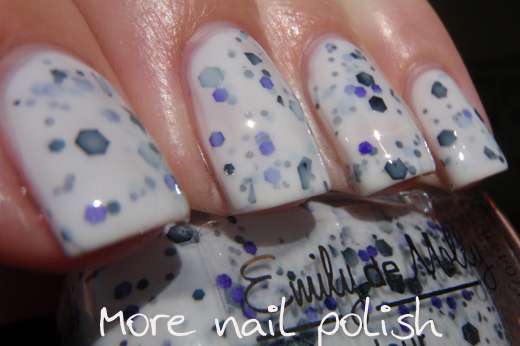 First up is It's Complicated which is a sheer white jelly with black and purple glitters. Her Etsy store says there is charcoal and charcoal holo glitter, but with the milky white base its hard to pick them out. I also like the little bit of black shredded glitter in this. 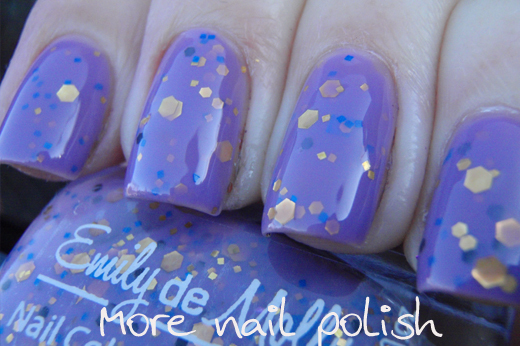 Just like with the other Emilty de Molly jelly polishes, this could be worn over a matching base, or built up to opacity as three coats. 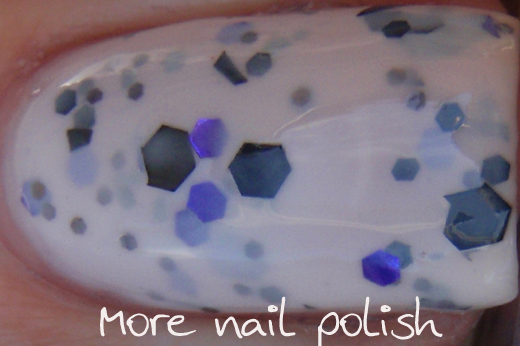 I chose to do three coats as I love seeing the hidden milky covered glitters beneath the surface. For a white polish, the formula on this was excellent, it didn't streak or dry chalky, it was lovely. This is three coats with a layer of Seche Vite top coat. As with her other polishes, all the glitters in this were great. They lay flat on the nail and there was no sign of bleeding discoloration. 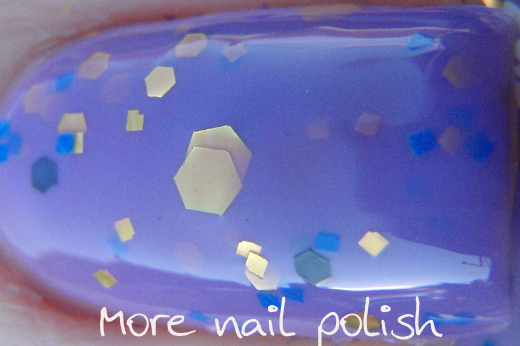 Regal Beginnings is a lavender jelly with black, gold and blue glitters in different shapes and sizes. This is three coats with Seche Vite top coat. This was the last EdM polish I wore and I left it until last because, from looking at the bottle, it was my least favourite. It definitely surprised me on the nail. The lavender base was exceptionally pretty and the light sprinkling of glitter was subtle because of the jelly coating on top. I like that this polish nearly looks like a creme, but then you can see the hidden glitters down a coat or two. Maybe this ones is more of a crelly? 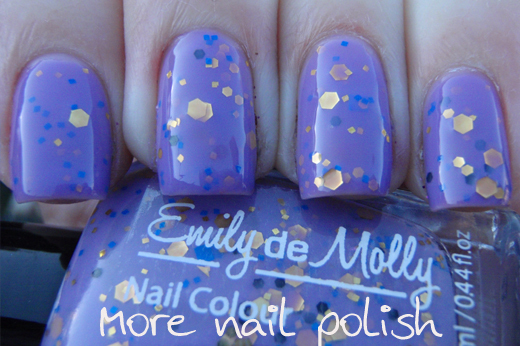 Emily de Molly polishes are available from the Emily de Molly etsy store and cost $10 USD each. Oh! I think I'm in love with both of these! Regal Beginnings is stunning, I am espically fond of jelly/creme hybrids. Gorgeous colours, I really love the golden glitters in Regal Beginnings. They really pop! 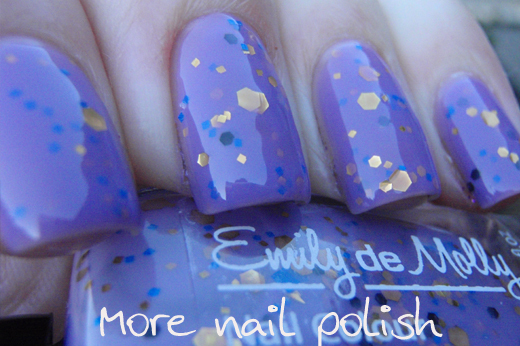 I've been loving Emily De Molly polishes for a while now, haven't bought from her yet because of the long shipping times. But your swatches are making me want to make the order! They're both gorgeous! Complicated is probably my favorite of the two. I might consider getting some of her polishes. I'd be willing to deal with the long shipping. Oooh It's Complicated is so pretty! I really like the white, very nice! Wow, Regal Beginnings is gorgeous, and I rarely like glitter polish! I may just have to get a bottle.